I have chartered up the West Coast as too far for my itty bitty boat to get there easily in summer, and I have walked the coast and the islands in winter and summer. The harshness of the living in some places is notable, but the amount of cr*p left behind by some land or fish farmers is appalling and makes me think of hunter gatherers depleting a hunting zone and moving, rather than gardeners and shepherds of valuable resources. I have no solution, a person on minimal income will not be willing to employ others to take away their waste, but visitors should show respect for those struggling to make a living there. white sandy beaches sea lochs and inlets , always voted in the top sailing destinations of the world , it gives you the Atlantic coast , small channels , fast tidal runs , outstanding beauty and great hospitality. I have since a child sailed up and down this coast and visited the islands camping and climbing and have never seen what you talk about, the main town of Barra , do people not go outside the town, you also mention life is a struggle ,what do you mean , for some this life is a blessing to get away from the Central belt or over crowded parts of England , and most of these little towns are run by many nationalities running bed and breakfasts and other enterprising crafts, prosperity is not defined by the little white painted houses from london owners that have bought up all the property in these English towns you mention. These so called deprived hamlets of the West Coast will also show some of the nicest people you will meet, this is a remote place little populated and little services , that is why is is unique, if you want to go sailing outside Blackpool that is your choice. Waste is a common problem in all Sea communities and I would be surprised if the rest of the UK did not suffer this blite Generally the more populate the worst it gets. What would you rather see when sailing, Dolphins. Orcas, Whales ,Puffins ,Seals, mountains and sea Lochs and little villages , or Rich houses nice cars and a Waitrose for your convenience, one wonders why you go sailing. Thats a rather offensive, incorrect sweeping generalisation, innit? Pretty accurate, though. 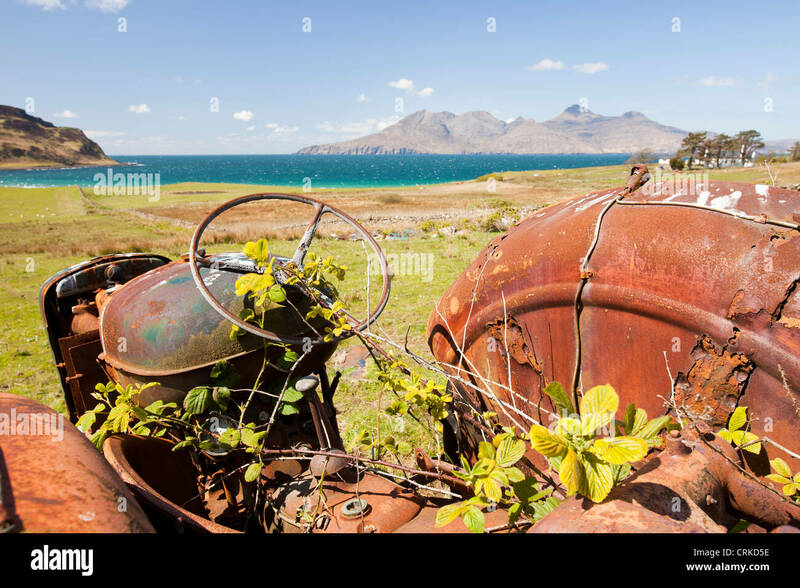 Almost any settlement in the islands is surrounded by a blight of abandoned machinery, vehicles and domestic appliances. I'm surprised that little of it seemed to go during the scrap iron boom a few years ago, but perhaps RET will make it worthwhile in future for some enterprising scrap dealer to go on tour. It is indeed very inconsiderate that some of us actually live and work here. We shall endeavour to remove all traces of modern human life and turn it into a giant theme part/ museum. It's not so much wanting to remove all traces of civilisation as thinking many places would look rather nicer without festering heaps of scrap anywhere. I suspect that those who live and work there in the tourist industry might feel the same. There is a happy medium between "sterilised Cotswold" and "linear scrap yard". That looks like a collector's item for some people I know! It also adds to the history and culture of those that went before us, why do we feel the need to remove certain old agricultural rusting items but we will not remove old stone buildings !! Yes fridges and the old fiesta is different , but in general this is rare. It's incredible how some folk take instances of things they don't like and extrapolate their opinion as being applicable everywhere. Anyone who is sane and has travelled widely around the West Coast will know that it is not blighted by wind powered turbines, fish farms, heaps of scrap or middens on every corner. The scale of Scotland's West Coast shows just how insignificant wind powered turbines and fish farms are, both of which I agree are an eyesore and get in the way, but only marginally. It's incredible how some folk take instances of things they don't like and extrapolate their opinion as being applicable everywhere. Anyone who is sane and has travelled widely around the West Coast will know that it is not blighted by wind powered turbines, fish farms, heaps of scrap or middens on every corner. I did say that in my experience linear scrap heaps are associated with (a) settlements (b) on islands. As you say, most of the place is nice and clean, although we did find that even the west-facing beaches on Coll are liberally strewn with plastic detritus. Which is hardly the fault of the locals. Ibut with the exception of the usual candidates (Tobermory, Plockton, Ullapool, etc), there are loads of places on the west coast where life is a struggle. Eigg, Muck, Mallaig, Arisaig.... feel free to complete the (rather long) list. Just call me Dougal, Sir Dougal to you. Thas no scrap, thas a runner!